After my purchase of that pattern a couple of years ago, I definitely had second thoughts. While I loved it when it was first available back in the 1970s – and at that time I was of the age when I probably could have actually worn it – I immediately realized it would not be appropriate for a 60-something-year-old! I tucked it away in my pattern file where I knew I would come across it occasionally and indulge a long-ago dream. Little did I know it would play a major roll in the realization of this polka-dotted dress. It took almost eight years for me to come up with a plan for this polka dot silk fabric. 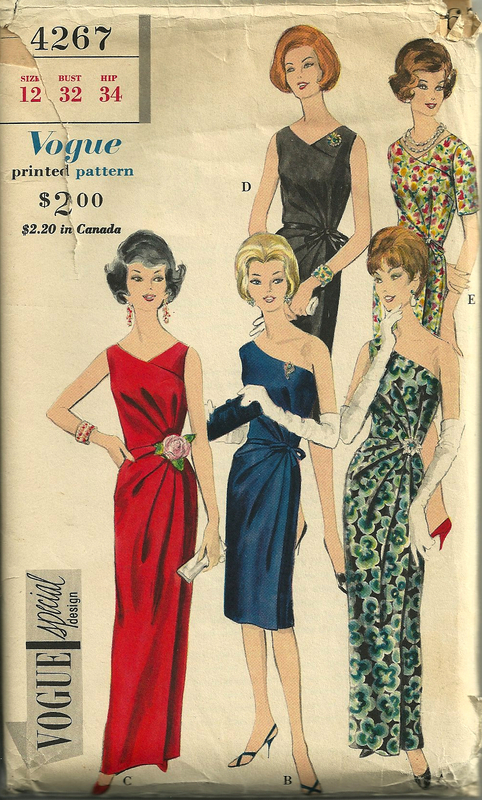 I kept envisioning a waisted, sleeveless dress with a “flowy” skirt, but I could not find a pattern I liked, either vintage or new. I wanted to avoid darts as much as possible (that’s a story in itself for someday), which meant I needed a princess style bodice. 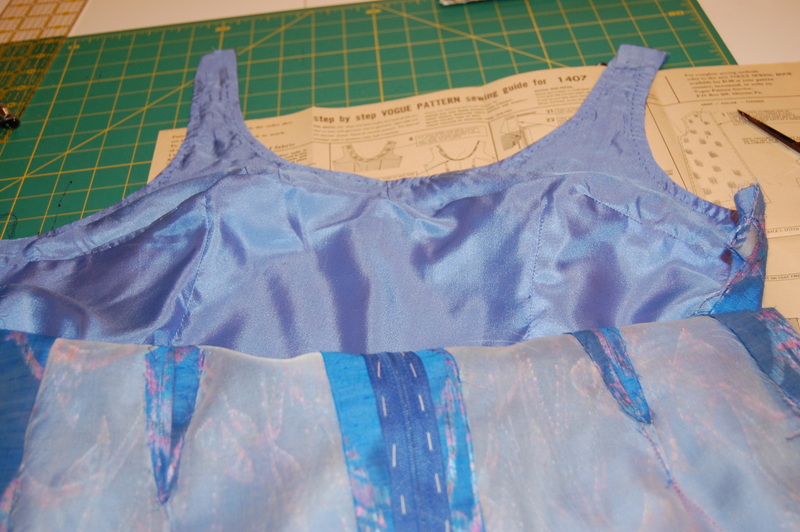 Many princess line bodices have side seams, but I wanted one without side seams, and with princess line seaming on the bodice back as well. Pondering all this, I again came across my Belinda Bellville pattern above and thought maybe it would work, with a few changes. But then I noticed that the bodice was supposed to be cut on the bias. 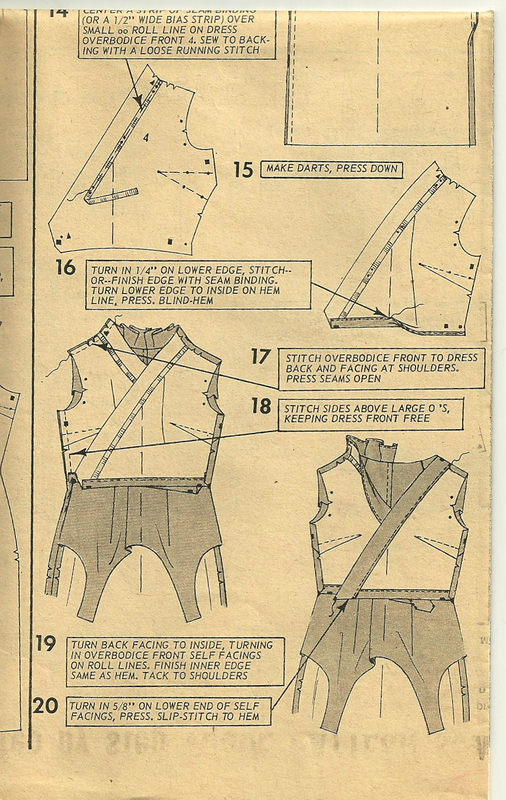 This pattern detailing from the instruction sheet shows the thee bodice pieces at the top of the picture. The bias is clearly marked. After not having any success in finding any other suitable pattern, I gave it another look. Why not cut it on the straight of goods? It was at least worth a try in muslin, so that’s what I did. 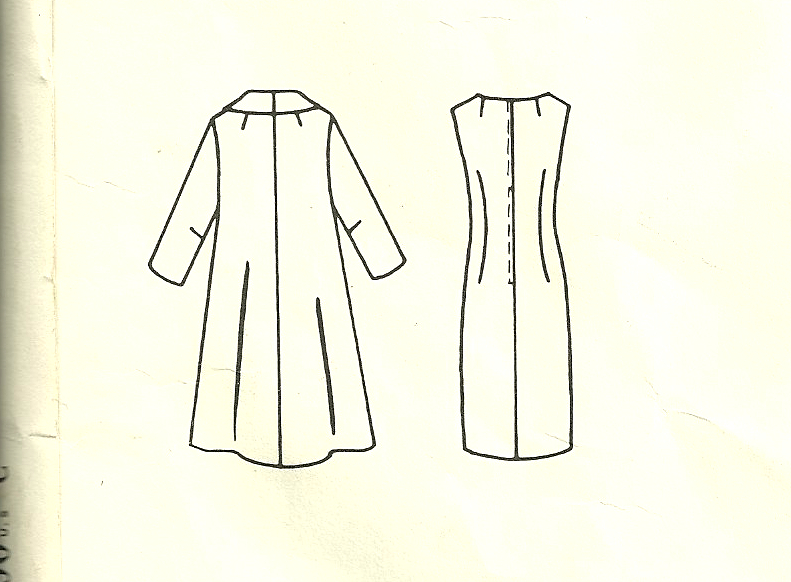 The changes I made to it included; 1) lowering the bust line, 2) eliminating the short-waisted front of the dress and restoring it to waist level, 3) placing the front center part of the bodice on the fold, eliminating the center seam, 4) lowering the neckline just a little, 5) making the waist larger, and 6) adding some ease across the back and shoulders. With all those changes, I had a bodice I really liked. 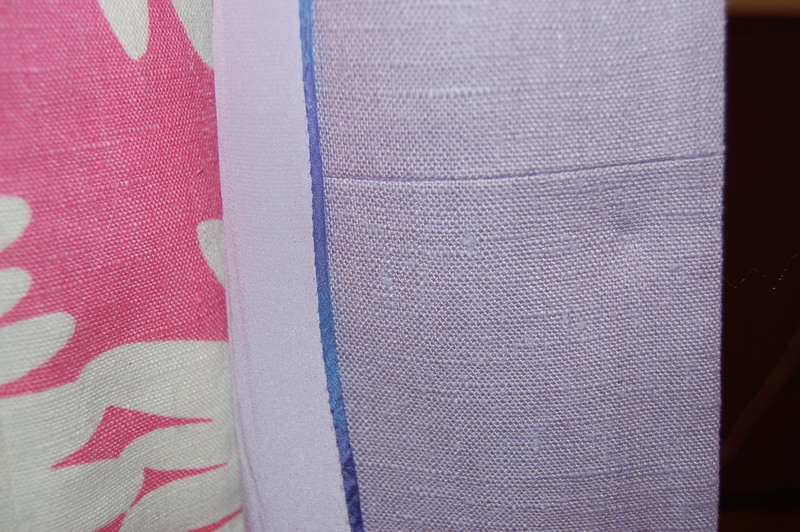 On the left is the one-piece tissue pattern for the skirt. 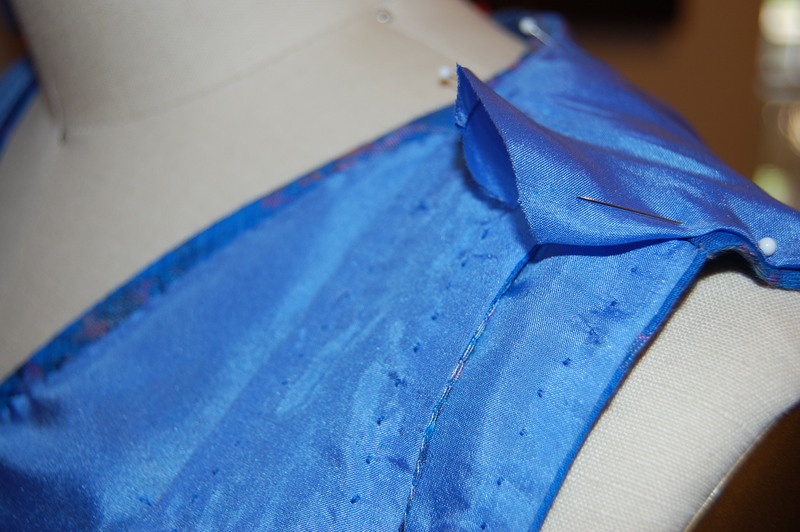 Using the dart lines on that pattern helped me determine the angles I needed for my skirt. It was about this time I got the idea to make this dress in a longer skirt rather than knee-length, which is where I usually wear my dresses. The only question I had was – did I have enough fabric to do this? My silk was 45” wide, and I only had two yards. I spent at least an hour laying out and eyeballing my muslin pieces on the silk, on the floor, just to see if I could possibly accomplish this task. I found one combination that would allow this, and took a photo so I could remember how to do it! It literally took an entire week to work out the pattern and perfect the muslin, but then the sewing began! 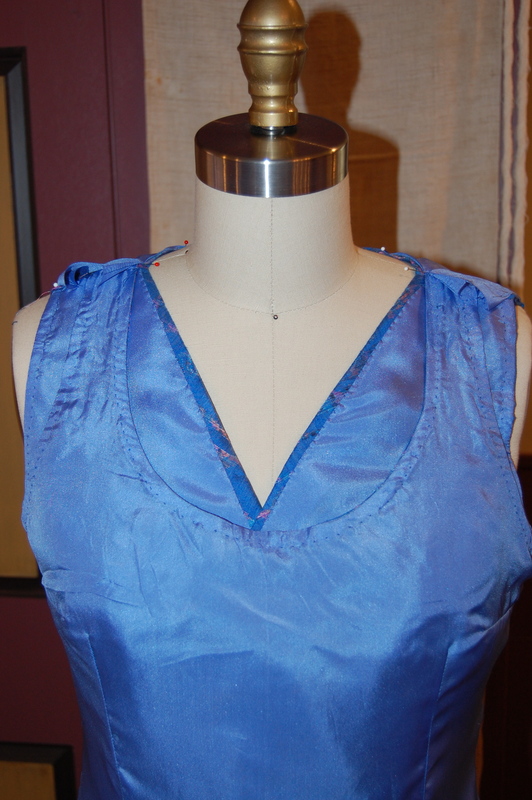 As soon as I completed the construction of the bodice, including its silk organza underlining, its catch-stitched raw seam edges, with the seam allowances around the neckline and armholes appropriately tacked in place, I knew I had a bodice which was just what I had envisioned. 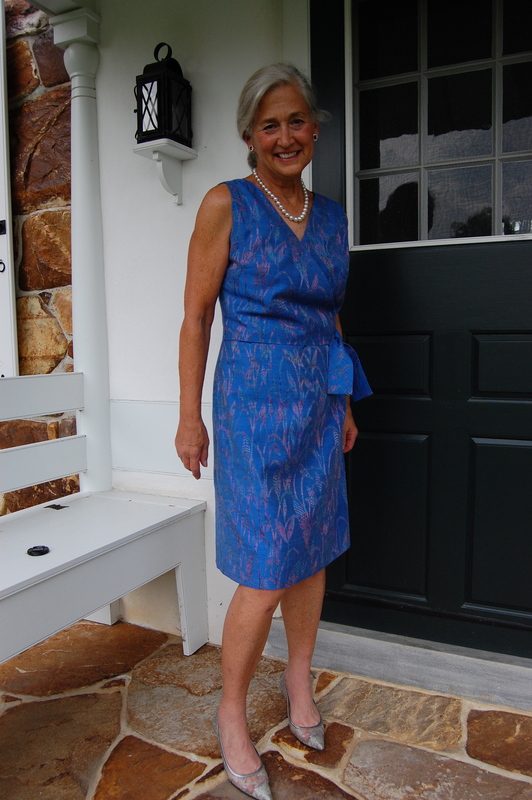 Somehow the skirt seams all matched up perfectly with the bodice seams and the center front inverted box pleat, which I added, looked wonderful, I thought. 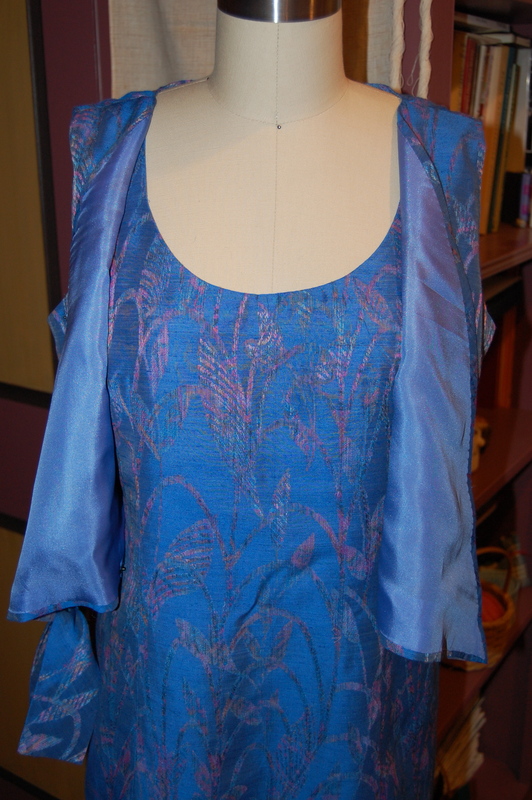 I made the lining out of navy blue crepe de chine, purchased from Emma One Sock Fabrics. When it came to under-stitching the neckline and armholes, I decided to do it in white. It mimics the white polka dots in the fashion fabric and also was much easier to see while doing all that handwork. Instead of a box pleat in the lining, I did two side pleats to reduce bulk in that critical tummy region! This is a very comfortable dress to wear! No attempt was made to match any dots, as the pattern was completely random. This is the hand-picked zipper. I love the fact that the navy thread shows up on the white and coral dots. And should I need a dress coat, this one matches the belt! While this dress was firmly in my queue for summer sewing, at the time I did my planning I was not making it for any special occasion. However, as good fortune would have it, two unforeseen occasions are now approaching in late summer for which this dress will be perfect. I am definitely looking forward to wearing these dots! Many of you, no doubt, are familiar with the “10,000 hour” theory. In a nutshell, it purports that to master something, artistically or technically, you must devote at least 10,000 hours to that endeavor (assuming you have a proclivity for it in the first place.) Well, cognitively I know I have a long way to go towards having 10,000 hours devoted to these Classic French Jackets, but it sure seems like I just devoted at least half of those hours to my current, just-finished jacket! That said, I was aware of an interesting phenomenon as I plugged away on this project. I felt more confident in the process on this one – and more confident in my ability to execute it well. I noticed this especially when I got to the point of inserting the sleeves. The sleeves are, as many of you know, inserted entirely by hand. In previous jackets this has always been my least favorite part. For one thing, you are working within the confined area of the armhole, with lots of very wide seam allowances and “flapping” fabric. It is messy, but precision is necessary to get a beautiful shoulder line and a sleeve that fits well and feels comfortable. This time it did not feel like an imperfect process; I actually felt like I knew what I was doing! Getting ready to insert one sleeve. Perhaps another of the clues to my feeling more confident in the process of this jacket is the fact that I felt I could take it in a little bit of a new direction. The most obvious departure from the norm is the fact that it has no buttons. Having seen some of the real Chanel jackets in my Pinterest feed that are embellished with bows instead of buttons, gave me the idea to change up this jacket. I really like bows, and I thought using bows would be the perfect foil to this rather regular, non-whimsical hounds-tooth boucle. I also decided I would eliminate the sleeve extensions and go for curved hems, set off by the trim alone – no bows even for this professed lover of them, as I thought that would be just too much. Before the trim is applied. 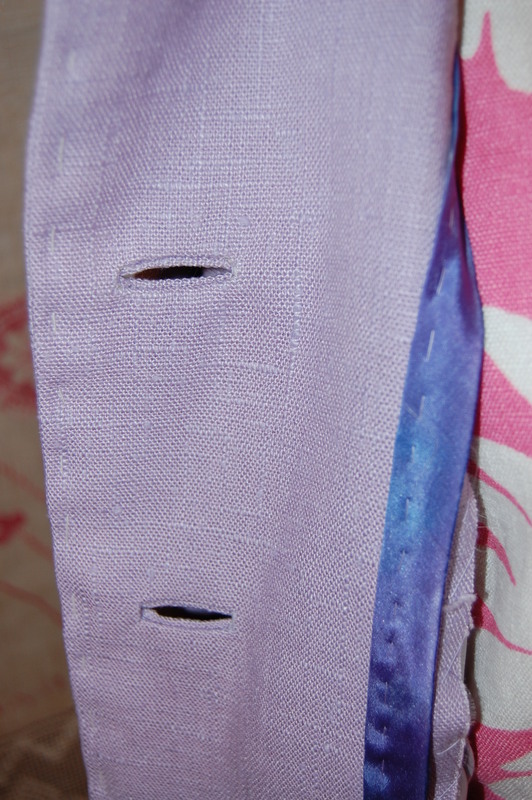 First some details on the waistline trim: I set the pockets to follow this line; the trim is continuous across the top of the pockets (which pick up the curved hems of the sleeves.) 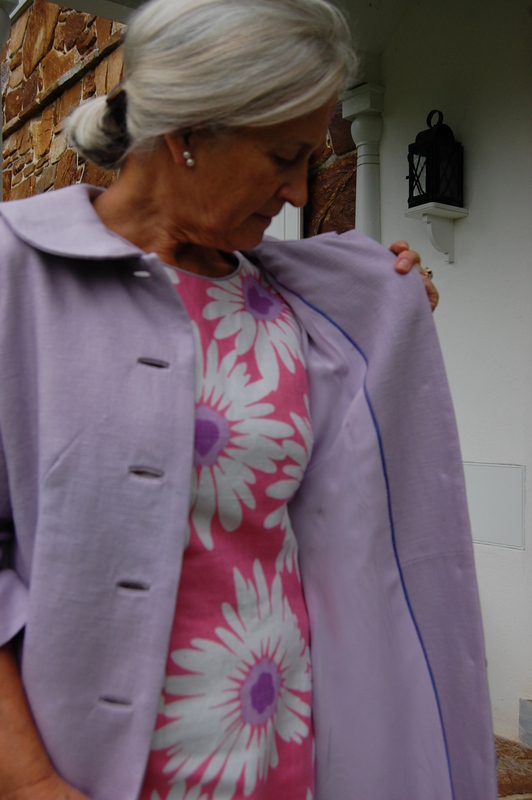 I gradually dipped the back edge of the jacket by ½ inch in the center back (a couture technique I picked up from Susan Khalje) and had the waistline trim follow that contour, which I think adds a very graceful look. 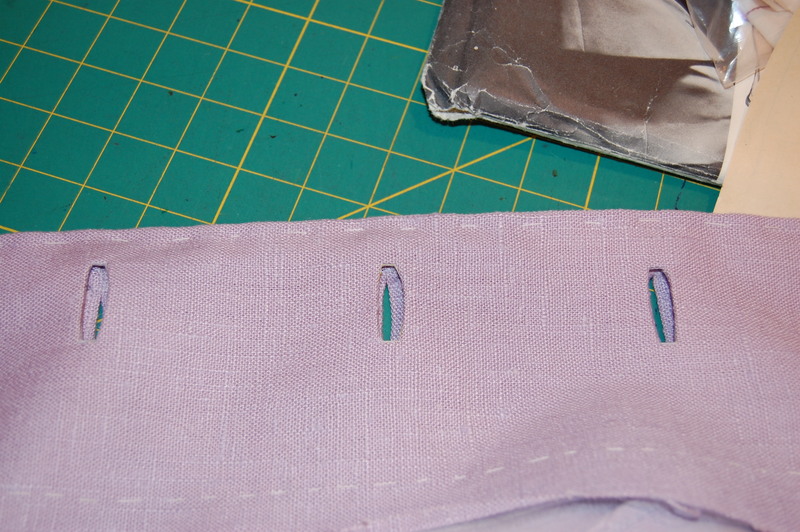 I sewed the pocket linings by machine, as that gave the curved dip a better turn. I sewed first along the stitching lines and then cut the curve. 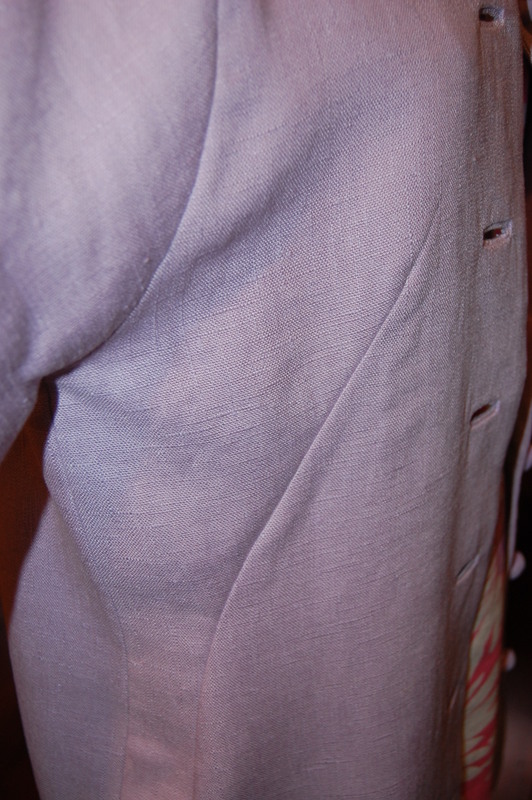 The slightly curved back of the jacket. Second, I decided I needed the trim across the upper bust as an anchor for the bow I had planned. Obviously I had to set this trim in place before I inserted the sleeves. 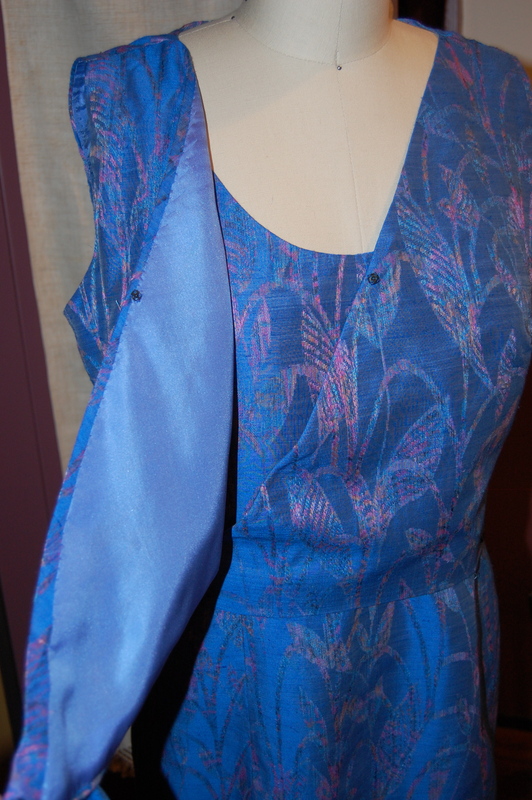 The left sleeve pinned in place, the trim already applied. It was a difficult decision for me to forego a printed lining for this jacket, but I am so glad I did. The black charmeuse has been tiring to work on for my blurry eyes, but it just seems right in this application. And just think – now I have an entire dress to concoct using more black lining! The boucle is from Mendel Goldberg Fabrics; the trim is from Britex Fabrics, and the black silk charmeuse lining is from Emma One Sock Fabrics. Until the matching dress is finished, a black sweater and black skirt will have to do. A red handbag is just what this rather dark and dreary day needs. I will definitely be ready for some bright Spring colors when this entire ensemble is finished. Summer slipped quietly away this week with nary a peep except for the sighs coming from my sewing room. No matter how hard I tried, I could not keep up with the calendar to finish my final Summer project. However, a few days late on “delivery” doesn’t really upset me, as I can look forward to wearing my Madame Gres-designed coat next Spring. I am not sure I can remember a sewing project which I have enjoyed more. 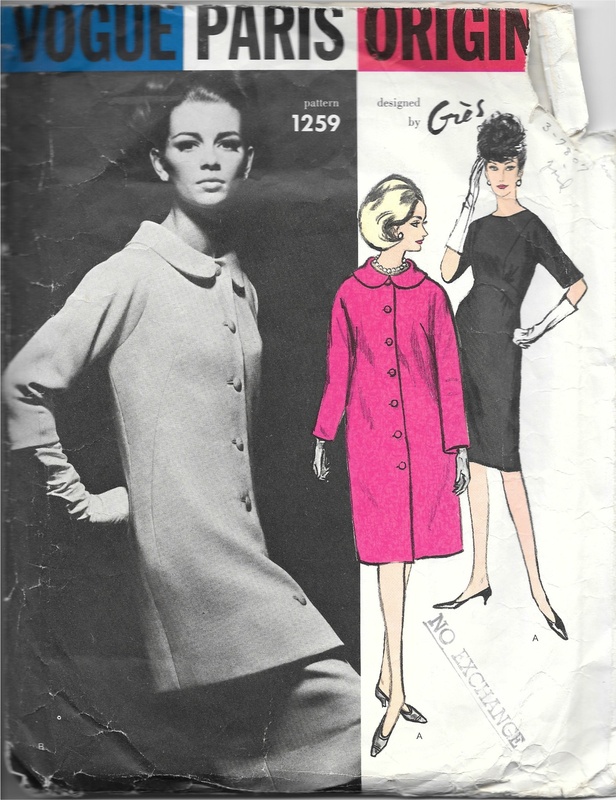 The coat pattern is actually quite a simple design, imaginatively shaped with unusual darts and seams. Perhaps the fact that I made it from vintage Moygashel linen helped make the sewing of it enjoyable, as the linen is so stable. Darts and seams can be crisply sewn and ironed, the grain of the fabric is so easy to see, and the fabric drapes with a fluid sturdiness, if that makes sense. 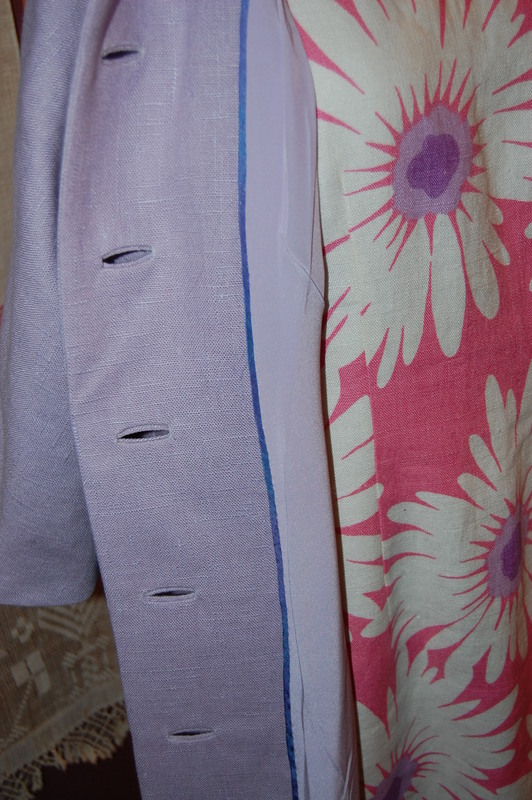 This shows the side darts which shape the coat and the dart/seam at the front of the kimono sleeve. 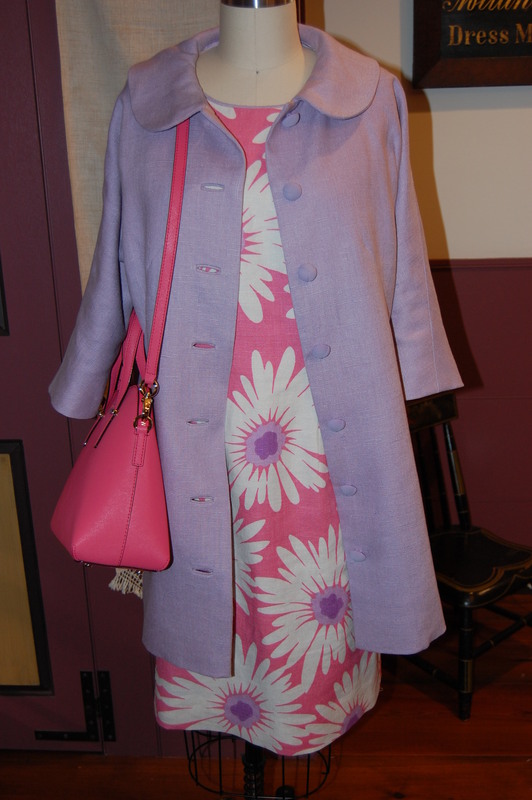 I covered the changes I made to those front darts in an earlier post; those were the only alterations I made to the final design except for lengthening the sleeves by one inch and the length of the coat by 1½ inches. Besides those shaping darts, there is one other feature of this coat which defines it. Do you know what it is? Yes, it is the bound buttonholes and their buttons. Seven of them, to be precise. 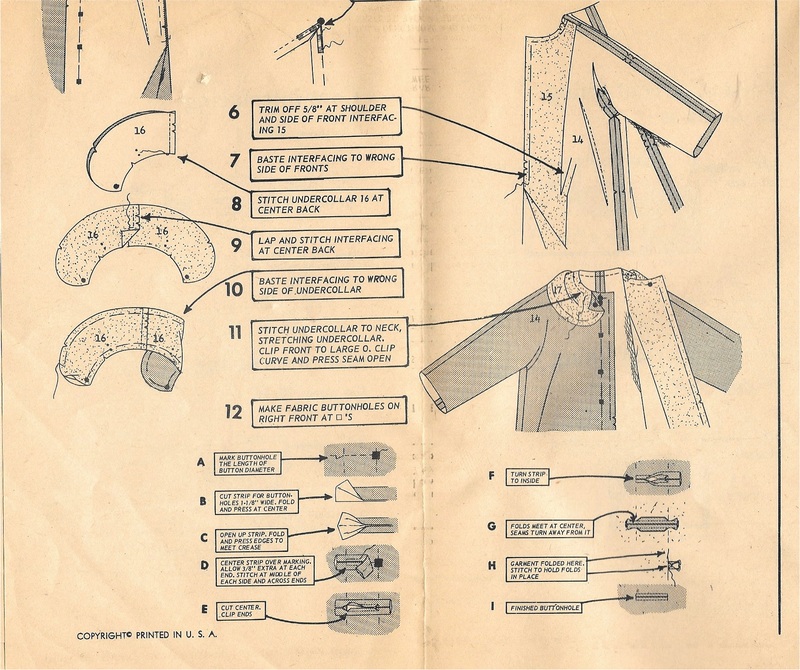 I love how these vintage Vogue patterns give such precise instructions; there are various ways to make bound buttonholes, but the method described here is my favorite. I have made a lot of bound buttonholes in my sewing life, but seven of them lined up as the focal point of the front of my coat is still a little intimidating. 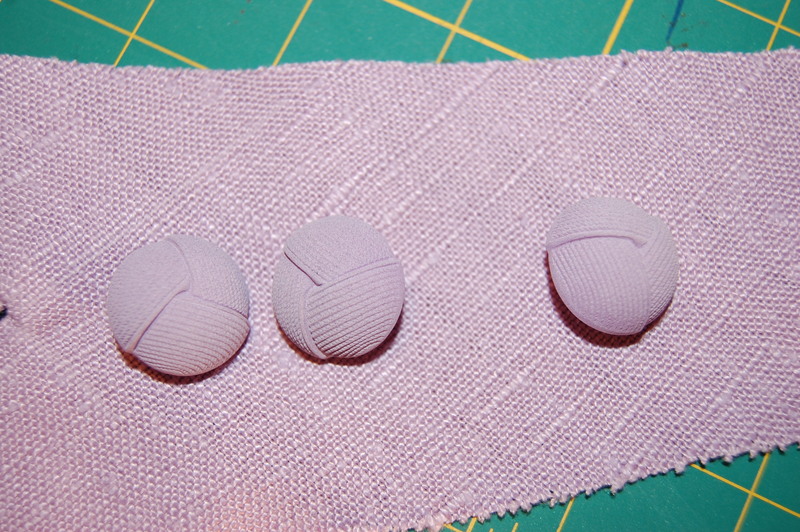 First of all, I had to find buttons that were “perfect.” I found some lavender buttons on the Britex website, and although they looked like a good match in color and appearance, ordering something like that online is always imprecise. However, when they arrived, they were, indeed, “perfect!” With buttons in hand, I made a sample buttonhole, as I always do. 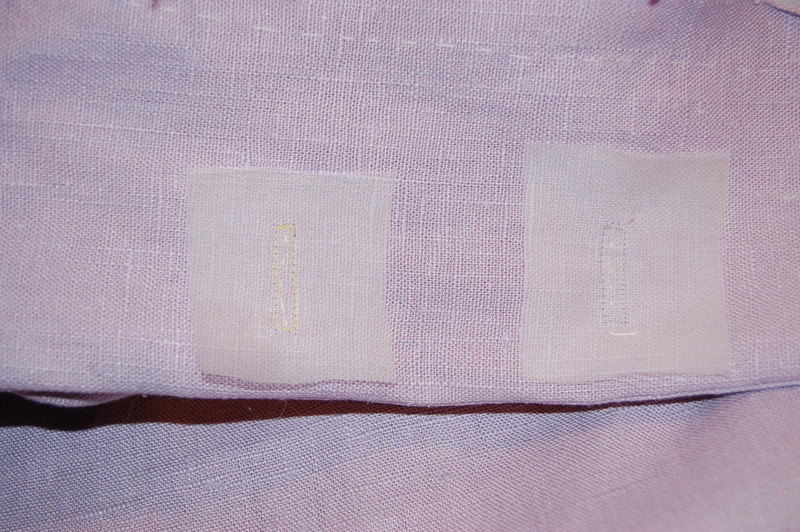 This photo shows the “monkey’s knot” design in the buttons, which compliments the linen weave, I think. 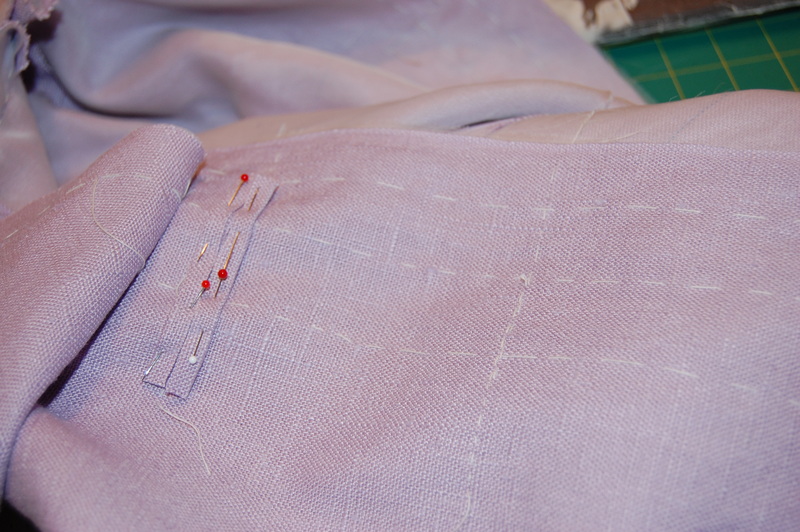 Then it was on to a marathon buttonhole session one afternoon. The most important ingredient in making successful bound buttonholes is precise marking. I finished the underside (on the facing) of the buttonholes using organza patches, which makes a beautiful, sturdy finish. Here is the underside of the buttonholes before I finished the edges. And here is the facing side, finished. 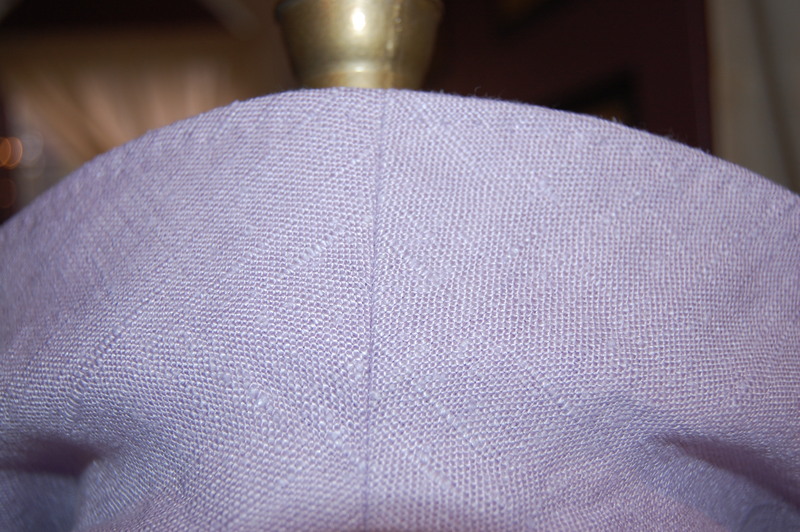 This is the undercollar, showing center back seam and the under-stitching I used to secure the perimeter seam. Fortunately my sister was visiting and so I could get her opinion on which one to order. 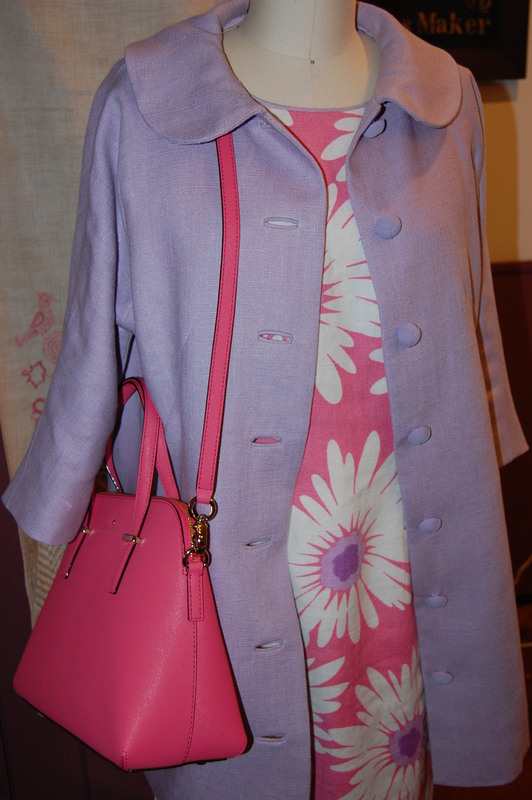 I was a bit smitten with the idea of a bright pink lining, but she wisely asked if I hoped to wear this Spring coat with dresses other than the pink flowered one which had inspired it. Well, yes, I do want that flexibility! That made the decision easy – I chose the pale lavender silk, which is just about a perfect match. 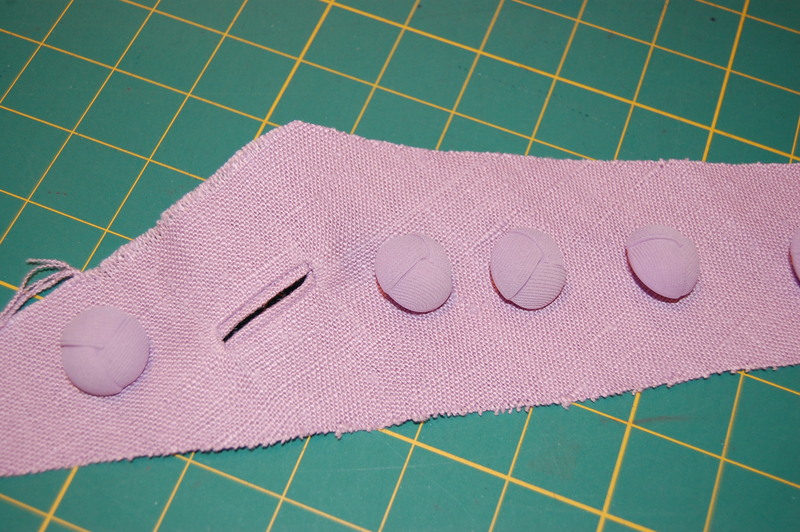 I added a bias, flat piped edge to the lining, which is now something I always do with coats and jackets I make. It is so easy and adds so much! This is a good look at the bound buttonholes and what they add to the overall look of the coat. If you visualize machine made buttonholes in their place, you will get an idea of how vital the bound ones are to the design of the coat. Do you ever have a specific color in mind when looking for fabric for a specific type of dress? I am usually open to changing my mind if something else wonderful appears, but this time I really, really wanted to find a blue fabric for a cocktail dress. 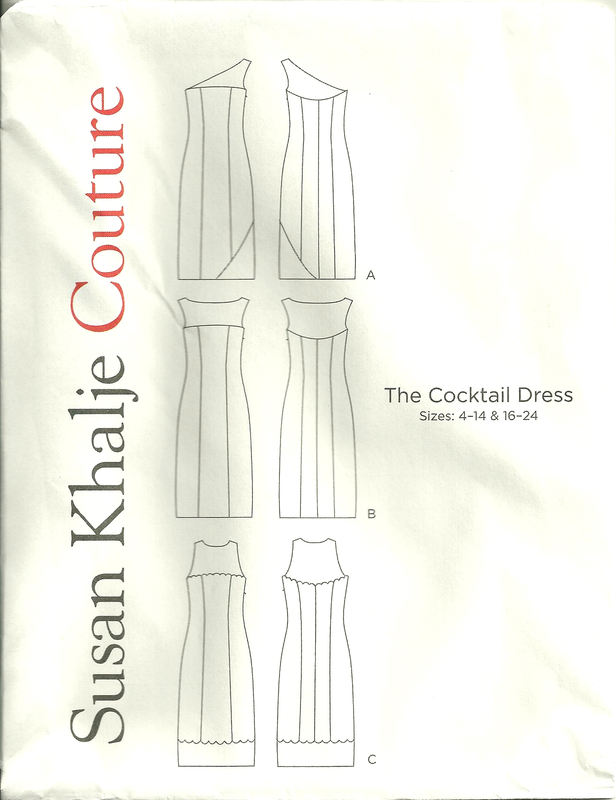 I started out thinking I would like a pale or periwinkle blue silk to pair with white lace, having Susan Khalje’s new Cocktail Dress pattern in mind. The version I was thinking I’d like to make is the third one, with lace for the top and bottom panels. I sent off for swatches – and more swatches – and even more, but I couldn’t find what I was looking for. This is what happens when one lives in an area which is devoid of fine fabric stores. ARGH! Then I found this lovely lightweight silk/linen/viscose blend at Emma One Sock. The color was just what I had in mind and I loved the feel of the fabric. The delicate woven design within this fabric catches glimmers of light. The subtle design is in shades of pink, green and peach. I really loved it. BUT – I knew it wouldn’t look good paired with lace. So-o-o-o, I thought to myself, maybe I’ll save the lace idea for another time. Maybe I should look at my pattern collection and see what other cocktail dress patterns might be more suitable. I picked out two more designs and gave myself some thinking time. View D would be my choice. Since the yardage needed was about the same for all the patterns, I felt confident ordering the fabric and making my decision after it arrived. Can you guess which design I finally chose – and why? The lightweight nature of this fabric also means that there will not be an excess amount of bulk in that double layered front. The fabric is ideal for underlining in silk organza, with a lining in luscious china silk which Emma One Sock helped to select for me. I spent several days working on a muslin (toile) for the dress, making some subtle changes which I’ll cover in a future post. The dress itself is now “under construction”! 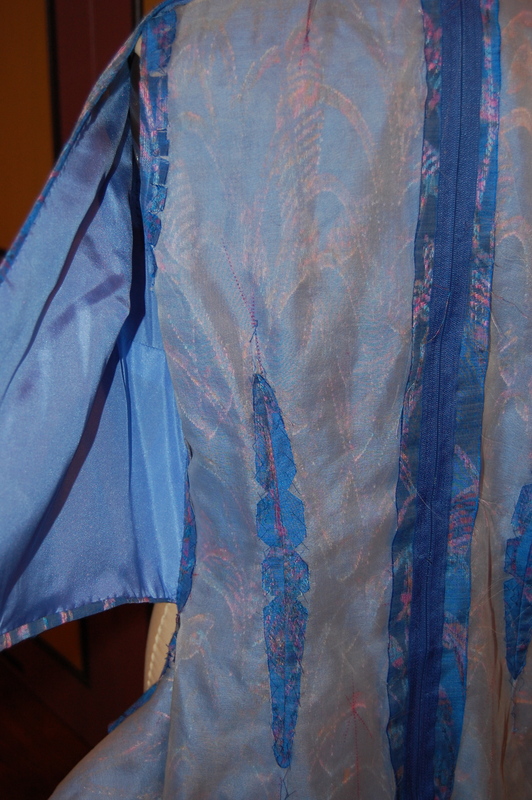 Of course, the longer I work with this beautiful fabric, the more I wonder if I should order more of it….? 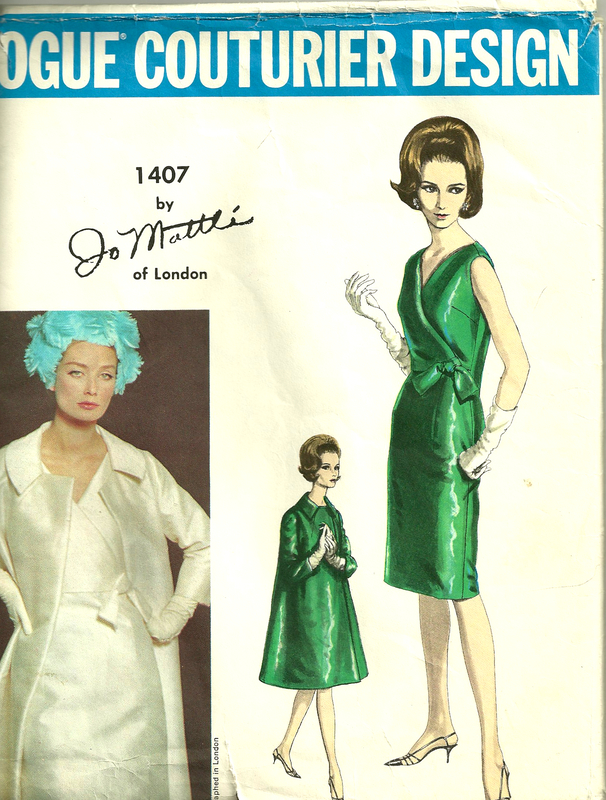 A coat with a lining to match the dress would be quite something, wouldn’t it? (Any coat would not be finished in time to wear to the early September event for which I am making this dress, but would I let a small detail like that keep me from a vision?) What do you think? Coat or no coat? And if I did make a coat, what color should it?